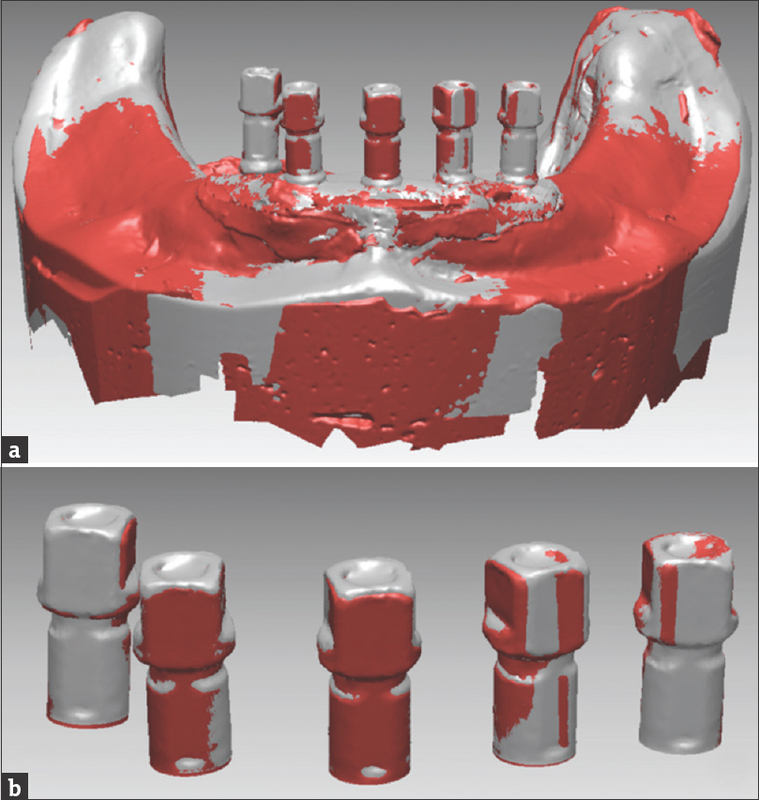 The purpose of this in vitro study was to compare the accuracy of four different impression techniques to obtain an accurate cast for fabrication of a full-arch mandibular edentulous simulation with five parallel implants. The hypothesis was that the different implant impression techniques would influence the dimensional accuracy of the definitive casts. Five internal connection bone-level dental implants (T4 3812, NucleOSS, Sanlilar Tibbi Cihazlar Medikal Kimya San Tic Ltd Sti, İzmir, Turkey) were placed in parallel in a commercially available edentulous mandibular model (Nissin Dental Products Inc., Kyoto, Japan). The distance between each implant hole was approximately 8 mm center to center between mental foramens, thereby simulating a common clinical situation. A cast analog to the reference model was produced in Type IV dental stone (Elite Rock Zhermack Type IV, Ro, Italy), upon which all custom trays for the open tray techniques were molded. The obtained cast was then covered with two layers of baseplate wax (Associated Dental Products Ltd., Purton, Swindon, Wiltshire, UK) to produce impression material with a constant thickness. Tray location was standardized during impression making by utilizing posterior tissue stops provided in the impression tray. The twenty customized impression trays were fabricated for the open tray impression techniques using light-cured custom tray material (Megagenta, Radeberg, Germany). Trays were perforated at the implant locations to allow access to the transfer coping screw. Forty impressions were made and evaluated by matching four impression techniques. Group 1 (G1): Closed tray (transfer) technique with snap-on plastic caps. Transfer impression posts with plastic caps (NucleOSS T0 3900, Sanlilar Tibbi Cihazlar Medikal Kimya San Tic Ltd Sti, İzmir, Turkey) were screwed into the implants [Figure 1], and an impression was made with a stock tray. After removal of the impression, the impression posts were unscrewed from the model. Thereafter, lab analogs (NucleOSS T4 4020 Sanlilar Tibbi Cihazlar Medikal Kimya San Tic Ltd Sti, İzmir, Turkey) were screwed to the impression posts and repositioned into the plastic caps that were fixed in the impression. Group 2 (G2): Closed tray (transfer) technique without snap-on plastic caps. Transfer impression posts were screwed into the implants [Figure 2], and an impression was made with a stock tray. The transfer impression posts were unscrewed from the model after removal of the impression. Lab analogs were then screwed to the impression posts and repositioned into the impression. Group 3 (G3): Open tray (pick-up) technique, splinted with dental floss and autopolymerizing acrylic resin. After screwing the impression copings onto the implants, the copings were splinted first with dental floss and then with an autopolymerizing acrylic resin (Pattern Resin LS, GC America Inc., Alsip, Illinois, USA) [Figure 3]a. The splint was separated after 17 min of application and reconnected with an autopolymerizing acrylic resin. When the open tray technique was performed, the tray filled with impression material was placed on the model, and impression material was then injected around the surfaces of the impression copings using a syringe [Figure 3]b. The impression was separated from the model after the screws of the coping were loosened when the impression material was completely set. Group 4 (G4): Open tray (pick up) technique with improved direct splinting to the tray. Each impression coping was screwed into place. The impression was dispensed into the perforated custom tray [Figure 4]a. The loaded tray was positioned in place, and once the impression was set, autopolymerizing acrylic resin was used to splint the impression copings to the tray [Figure 4]b. First, the screws of the impression copings were loosened, and the impression was then separated from the model. Implant analogs were screwed to the impression copings that were fixed in the impression. Regular-viscosity vinyl polysiloxane (VPS) (Hydrorise Maxi Monophase, Zhermack, Ro, Italy) was the impression material of choice for all transfer procedures. The stock trays and acrylic resin trays were coated with tray adhesive (Universal Tray Adhesive, Zhermack, Ro, Italy). The adhesive was allowed to dry for 15 min before impressions were made. The impression materials were prepared directly from the polyester bag using an automated mixing device (Modulmix, Zhermack, Ro, Italy). The mixed impression materials were applied around the impression copings and loaded into the tray at the same time. The custom tray was seated gently with finger pressure until the material was properly set. The tray was then removed. The recommended setting time of 4 min was increased to compensate for impression setting at room temperature instead of mouth temperature. All impressions were stored at room temperature (25°C). In accordance with the manufacturer's instructions, vacuum-mixed Type IV dental stone (Fujirock EP; GC, Tokyo, Japan) was used to pour each impression. Before being removed from the impressions, the casts were allowed to set for 1 h.
A minimum significant difference in deviation of 0.05 mm was determined from available literature on accuracy of implant impressions. Power analysis was conducted based on this minimum significant difference in deviation, using alpha at level 0.05, at 80% power, and a ∝ of 0.0048 according to authors' preliminary study. On the basis of these data, the number of samples required to be enrolled to conduct this study has been calculated as 10. The SPSS statistical program package for Windows (SPSS; Chicago, Illinois, USA) was used to perform statistical analyses. Descriptive and homogeneity tests were applied. Distortion values among the groups were analyzed using one-way analysis of variance at a 0.05 level of significance. The evaluated variable was the impression technique. A least significant difference (LSD) post hoc test was performed to identify multiple comparisons (P = 0.05). Friedman's test was used to compare the impression techniques. The accuracies of four different impression techniques for edentulous mandibular arches with five parallel implants were compared. Four groups of ten casts were created, for a total of forty casts. Fifty measurements of each cast were made. All deviations were calculated for the five implants (n = 50). The descriptive statistical analyses of angular, coronal, and apical deviations are shown in [Table 1]. The lowest accuracy was obtained in G2 when angular (1.48°), coronal (0.32 μm), and apical (0.1 μm) deviations were tested. The mean angular deviations of G1, G3, and G4 were 0.59°, 0.43°, and 0.52°, respectively. Similarly, mean coronal and apical deviations were obtained from G1, G3, and G4 [Table 1]. The post hoc LSD test results indicated that three of the impression techniques (G1, G3, and G4) had no significant effect on the mean 3D discrepancy, while the results in G2 were statistically less accurate than those of the other three groups (P > 0.05) [Table 2]. When the reliability of the methods was assessed separately for each parameter, G4 seemed to exhibit the most reliable measurements, while G3 showed the least reliable measurements. Impression accuracy is an important factor that influences the precision of fit.,,, The objective of this study was to compare the accuracy between fabricated casts that were made using four different impression techniques. The study was designed to simulate the clinical scenario involving a completely edentulous mandible that needs to be restored with a fixed implant prosthesis with five parallel implants. Statistical analysis revealed that the different implant impression techniques influenced the dimensional accuracy of the definitive casts [Table 1] and [Table 2]. The splinted technique, improved direct splinted technique, and closed tray impression technique with plastic caps provided similar accuracies when impressions of parallel-placed multiple implants were made. The closed tray impression technique without plastic caps was less precise than the other three techniques. Therefore, the hypothesis that the different implant impression techniques would influence the dimensional accuracy of the definitive casts was accepted. To date, although the accuracy of implant impression techniques has been extensively examined in the literature,,,,,,,,,,,,,,,,,,,,, no consensus has been reached. The majority of these studies have reported better results with splinting impression coping techniques.,,,,,,,,,, These reports emphasize the advantage of maintaining the transfer copings in the impression because this procedure avoids the need for replacement of the copings in the impression. Conversely, certain authors have reported superior accuracy when the undirected technique is used , and have indicated that the torque needed to fasten square copings on analogs when using the direct technique creates more distortion than any inaccuracy attributable to the replacement of the copings. Nonetheless, conflicting results exist in the dental literature regarding whether splinting should be used, as some studies have stated that no improvement is observed with the splinting process compared to the unsplinted direct or indirect methods.,, With respect to the comparison of the indirect versus the unsplinted direct technique, the present study showed that neither of the two procedures was superior when snap-on impression caps were used. The findings regarding the indirect techniques showed that nonparallel implants may cause inaccuracy. In the direct technique, the impression coping remains in the impression, and thus, the effect of the implant angulation and the deformation of the impression material upon recovery from the mouth will be reduced. It appears that implant divergence influences the impression accuracy when using internal connection implants.,,,,,,,, If multiple implants are inserted in parallel, no horizontal shift in the transfer will occur; if the implants are angled, rotational misfit leads to a horizontal discrepancy. This distinction could explain why both techniques yielded comparable results in this investigation. One advantage of the splinted technique is the greater transfer precision due to the stability of the impression copings during removal of the impression and analog connection. However, factors such as limited mouth opening, less susceptibility to gagging, superior patient comfort, and a reduced time requirement necessitate the use of the closed tray technique. Some studies have addressed the snap-fit impression implant-level impression copings., These studies have found that the use of snap-fit impression copings is more precise than open tray copings and have stated that snap-fit impressions are more accurate than the transfer technique. Among the impression techniques evaluated in the present study, the snap-fit impression technique showed a similar accuracy to the splinted direct and the improved direct splinted techniques. Moreover, the use of snap-fit impression copings produced superior results to those of the closed tray technique (without snap-fit impression copings) for multiple implants. The snap-fit copings are thought to decrease the rotation of impression copings during analog insertion due to the lack of a screw-fastening step. However, the treatment cost is increased with this type of coping because it is disposable. Almost all implant systems, regardless of the level of impression recording (abutment or implant level), use square impression copings for pick-up impressions and tapered or conical copings for closed tray impressions. Slight variations occur in the shapes of these copings, especially for the retentive features. Rashidan et al. examined the impression coping effect on the accuracy of two implant systems and found that the coping shape had a significant effect, while the technique did not have a significant effect. Abutment-level snap-fit impression copings were used in this study, which showed the superiority of the snap-fit technique to the transfer technique. It should be noted that the five internal connection implants in the reference resin model in this study were almost parallel, which facilitated the removal of copings without distortion after the polymerization of the impression material. Many studies have shown no difference in the accuracy of polyether or VPS, and both materials are recommended for implant impressions., An elastic impression material such as VPS to reduce the permanent deformation of the impression material caused by the stress between the material and the impression copings was preferred to use. Thus, VPS was the material of choice for evaluating the differences among impression techniques for the present study. Further studies, particularly with different implant level and abutment level snap-fit impression copings, are needed to determine the effect of the impression coping on the accuracy of impressions that are made from nonparallel multiple implants. Different methods have been used for measuring impression accuracy. In these studies, the positional changes of the analogs were evaluated by a digital technique, coordinate measuring machine,,, measuring microscope, or strain gauges. Among these methods, more precise results were obtained with the digital method, as also indicated in a recent similar study by Kurtulmus-Yılmaz et al., who evaluated angular and coronal discrepancies of two angulated implants and obtained more successful results from the splinted direct impression technique. In the present study, apical, coronal, vertical, and angular discrepancies of five parallel implants were evaluated, and similar successful results were achieved in the direct splinted groups (G3, G4). Moreover, we also obtained results from the closed tray technique with plastic caps group (G2) that were statistically similar to those of the direct splinted groups; the closed tray technique was not included in the study by Kurtulmus-Yılmaz et al. The results of this study are limited to parallel and 2-mm depth-level implants and may not have similar outcomes in other situations. The angle and depth of the implants have been shown to affect the accuracy of the impression.,,,, For example, parallel implants result in more convenient removal of the impressions with less distortion than angulated implants. In addition, the role of saliva was not taken into account. Clinical studies on impression accuracy are needed to substantiate the statistically significant results found in this in vitro study because the in vitro findings may or may not translate into clinical significance. Under the limitations of this in vitro study, the following conclusions were drawn. Improved cast accuracy could be achieved using the direct splinted technique, improved direct splinted technique, or indirect impression technique with plastic caps when impressions of five parallel-placed implants were obtained. Less successful results were achieved using the direct impression technique without plastic caps. The improved direct splinted technique was found to be the most reliable method when obtaining parallel-placed, multiple-implant impressions. The authors gratefully acknowledge Prof. Dr. Nazan Alparslan, Department of Biostatistics, Faculty of Medicine, Cukurova University, Adana, Turkey, for her assistance with the statistical analysis. Furthermore, the authors thank SANLI Dental for supplying the implant components and TFI for supporting the study. Kunavisarut C, Lang LA, Stoner BR, Felton DA. Finite element analysis on dental implant-supported prostheses without passive fit. J Prosthodont 2002;11:30-40. Wee AG, Aquilino SA, Schneider RL. Strategies to achieve fit in implant prosthodontics: A review of the literature. Int J Prosthodont 1999;12:167-78. Sahin S, Cehreli MC. 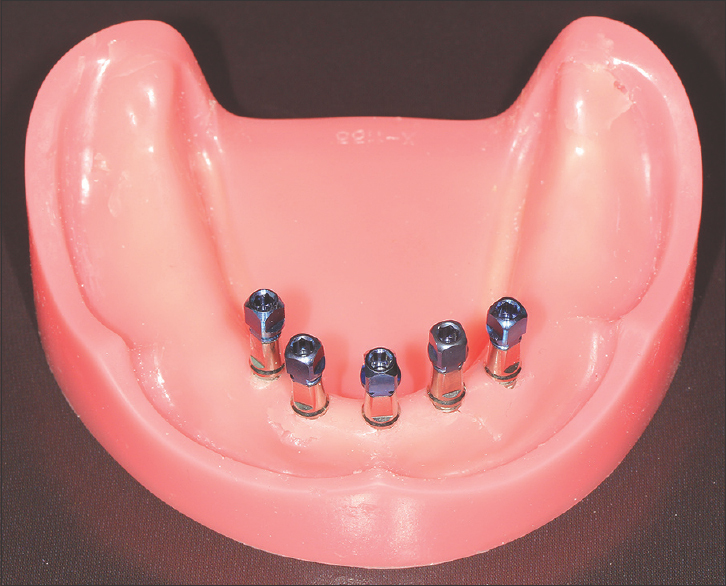 The significance of passive framework fit in implant prosthodontics: Current status. Implant Dent 2001;10:85-92. Assif D, Nissan J, Varsano I, Singer A. Accuracy of implant impression splinted techniques: Effect of splinting material. Int J Oral Maxillofac Implants 1999;14:885-8. Chang WG, Vahidi F, Bae KH, Lim BS. Accuracy of three implant impression techniques with different impression materials and stones. Int J Prosthodont 2012;25:44-7. Akça K, Cehreli MC. Accuracy of 2 impression techniques for ITI implants. Int J Oral Maxillofac Implants 2004;19:517-23. Conrad HJ, Pesun IJ, DeLong R, Hodges JS. Accuracy of two impression techniques with angulated implants. J Prosthet Dent 2007;97:349-56. Papaspyridakos P, Chen CJ, Gallucci GO, Doukoudakis A, Weber HP, Chronopoulos V, et al. Accuracy of implant impressions for partially and completely edentulous patients: A systematic review. Int J Oral Maxillofac Implants 2014;29:836-45. Kurtulmus-Yilmaz S, Ozan O, Ozcelik TB, Yagiz A. Digital evaluation of the accuracy of impression techniques and materials in angulated implants. J Dent 2014;42:1551-9. Assunção WG, Britto RC, Ricardo Barão VA, Delben JA, dos Santos PH. Evaluation of impression accuracy for implant at various angulations. Implant Dent 2010;19:167-74. Martínez-Rus F, García C, Santamaría A, Özcan M, Pradíes G. Accuracy of definitive casts using 4 implant-level impression techniques in a scenario of multi-implant system with different implant angulations and subgingival alignment levels. Implant Dent 2013;22:268-76. Gotfredsen K, Wiskott A, Working Group 4. Consensus report-reconstructions on implants. The third EAO consensus conference 2012. Clin Oral Implants Res 2012;23 Suppl 6:238-41. Lee HJ, Lim YJ, Kim CW, Choi JH, Kim MJ. Accuracy of a proposed implant impression technique using abutments and metal framework. J Adv Prosthodont 2010;2:25-31. De La Cruz JE, Funkenbusch PD, Ercoli C, Moss ME, Graser GN, Tallents RH, et al. Verification jig for implant-supported prostheses: A comparison of standard impressions with verification jigs made of different materials. J Prosthet Dent 2002;88:329-36. Wenz HJ, Hertrampf K. Accuracy of impressions and casts using different implant impression techniques in a multi-implant system with an internal hex connection. Int J Oral Maxillofac Implants 2008;23:39-47. Hariharan R, Shankar C, Rajan M, Baig MR, Azhagarasan NS. Evaluation of accuracy of multiple dental implant impressions using various splinting materials. Int J Oral Maxillofac Implants 2010;25:38-44. Daoudi MF, Setchell DJ, Searson LJ. A laboratory investigation of the accuracy of two impression techniques for single-tooth implants. Int J Prosthodont 2001;14:152-8. Rashidan N, Alikhasi M, Samadizadeh S, Beyabanaki E, Kharazifard MJ. Accuracy of implant impressions with different impression coping types and shapes. Clin Implant Dent Relat Res 2012;14:218-25. Choi JH, Lim YJ, Yim SH, Kim CW. Evaluation of the accuracy of implant-level impression techniques for internal-connection implant prostheses in parallel and divergent models. Int J Oral Maxillofac Implants 2007;22:761-8. Aguilar ML, Elias A, Vizcarrondo CE, Psoter WJ. Analysis of three-dimensional distortion of two impression materials in the transfer of dental implants. J Prosthet Dent 2010;103:202-9. Ozcelik TB, Yilmaz B. 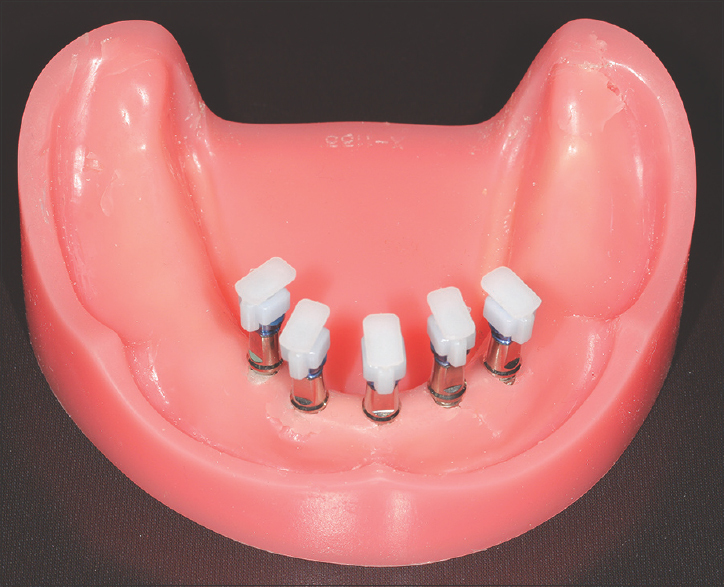 A functional open-tray impression technique for implant-retained overdenture prostheses. J Oral Implantol 2012;38:617-9. Ozan O, Orhan K, Turkyilmaz I. Correlation between bone density and angular deviation of implants placed using CT-generated surgical guides. J Craniofac Surg 2011;22:1755-61. Stimmelmayr M, Erdelt K, Güth JF, Happe A, Beuer F. Evaluation of impression accuracy for a four-implant mandibular model – a digital approach. Clin Oral Investig 2012;16:1137-42. Naconecy MM, Teixeira ER, Shinkai RS, Frasca LC, Cervieri A. Evaluation of the accuracy of 3 transfer techniques for implant-supported prostheses with multiple abutments. Int J Oral Maxillofac Implants 2004;19:192-8. Ongül D, Gökçen-Röhlig B, Şermet B, Keskin H. A comparative analysis of the accuracy of different direct impression techniques for multiple implants. Aust Dent J 2012;57:184-9.